Short for wiper die; the tool in a rotary-draw bending set-up which prevents the formation of a terminal hump or wrinkle (which see) on the inside radius of the bend. 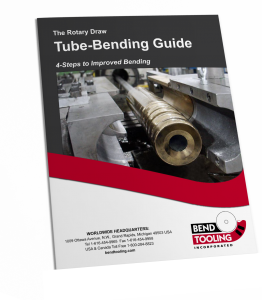 The wiper is fixtured between the cavity of the bend die and the tube immediately behind the line of tangency. The critical feature of a wiper is the feathered edge, which prevents the terminal hump from exceeding its yield point and setting into a wrinkle. Precision machining of this edge is paramount for good performance. Aluminum-bronze and alloy steel are the most common materials for wipers. While steel offers good durability under the right circumstances, it galls when used on steel tubing, especially stainless steel. Aluminum-bronze has the advantage of resisting galling, so that it tends to wear out instead of fail. Consequently, aluminum-bronze is preferred for steel tubing and steel for non-ferrous tubing. Like mandrels, wipers are available in solid-body and inserted versions. Inserted wiper tooling has been widely used for about two decades and have completely supplanted solid-body wipers in a number of industries, especially automotive. An inserted wiper consists of a disposable feathered edge, the wiper insert, which is pocketed into a steel fixture, the wiper holder. The inserted wiper offers ease of use and reduced cost over the traditional solid-body wiper and can be used in all applications except those requiring zero-rake.